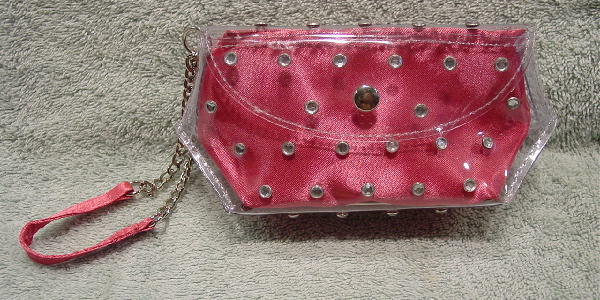 This cute little evening purse has a clear PVC outer shell with rows of rhinestones covering the surface. It has a dark pink 100% polyester removable lining. The bottom of the PVC shell has a silver-tone bar with Victoria Secret etched on the center. It has a one snap flap closure with a 3 1/2" double chain link wrist strap which is attached to a 4 5/8" by 3/8" fabric strap in the center and a silver-tone ring on the upper left side. It's big enough to hold a cell phone, credit card, lipstick, and house keys.